In the 1960s, India made headlines with its Green Revolution, using high-yielding varieties and improved technology to more than double its output of wheat between 1965 and 1972. Today, India is pushing ahead with a Blue Revolution, the rapid increase of fish production in small ponds and water bodies, a boon to small farmers, the nation's nutrition and its gross domestic product. JURONG Fishery Port was abuzz with activity yesterday as Singapore's first half-tonne shipment of 'super sea bass' arrived from Indonesia. Hatched in the research tanks of the Agri-Food and Veterinary Authority's (AVA) Marine Aquaculture Centre (MAC) on St John's Island, the fast-growing fry were fattened for harvest on an offshore farm in Riau. With a survival rate of up to 80 per cent, MAC's fry are twice as hardy as wild fry, and able to grow up to 15 per cent faster, reaching market size - about 500g - in under six months. Yesterday's inaugural load is the first of many, said the AVA, as the successful harvest will help boost the Republic's future fish stocks - translating into a sustainable and affordable supply of quality fish. The entire shipment of live sea bass was snapped up even before the fish was netted out of the sea - at a wholesale price of about $7 per kg, comparable to current market prices, said the AVA. To help widen the supply net, 400,000 of the specially bred fry have been supplied to the Riau farm since last year. The farm is expected to produce up to 100 tonnes of fresh fish monthly, for the next two years - or close to 7 per cent of all sea bass eaten here. At the same time, another 400,000 fry have been supplied to fish farms here, which have been already selling the adult sea bass to the local market over the past six months. A large-scale marine farm in southern Singapore is also expected by the end of this year, with a projected production capacity of up to 3,000 tonnes of fish annually by next year. Together, the farms will produce about 6 per cent of the fresh fish consumed here yearly, creating another stable supply of food for the Republic, said Mr Lim. Singaporeans consume about 72,000 tonnes of fresh fish a year, with most coming from farms in Malaysia, Indonesia and Thailand, said the AVA. The special sea bass fry were produced through a 'painstaking process of selective breeding', said Mr Lim. Generations of the fish were bred and selected for desirable qualities, including size, growth and survival rates - a process which took three years, he explained. 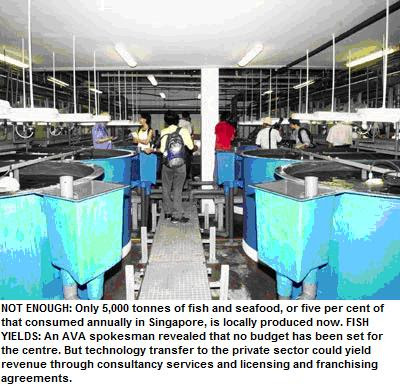 The AVA's Marine Aquaculture Centre aims to develop the technology that will allow Singapore to produce 40 per cent of its food fish needs in eight years. MORE of the fish you eat could be grown here over the next few years. Researchers at a $33-million research and development facility on St John's Island are perfecting the techniques of large-scale fish breeding and rearing. They hope their work will result in production of almost half the fish people eat here. Only 5,000 tonnes of fish and seafood, or 5 per cent of that eaten here a year, is produced locally now. 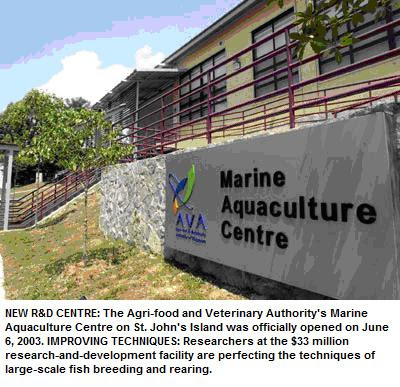 But the Agri-Food and Veterinary Authority's (AVA) Marine Aquaculture Centre, which was opened officially yesterday, 11 aims to increase the annual figure to 40,000 tonnes in eight years. The centre will be working with commercial partners to hit the target, said AVA's chief executive officer Ngiam Tong Tau. 112 Large bags of micro-algae are grown 111 to feed micro-organisms such as brine shrimp which are used to feed the fry before they are weaned onto dry food. The fish being produced by the centre include Asian seabass, golden trevally, snapper and pompano. The AVA's involvement in aquaculture dates back to the 1970s, when, as the Primary Production Department, it worked with cf,mti kelong cf,mtr operators 15 to farm high-value species which they caught. It also pioneered the development of shallow coastal floating net cages ? where the fish live in nets placed in the sea. There are 86 such farms, which make up 4 per cent of the 100,000 tonnes of fish eaten here every year; the other 1 per cent comes from land-based farms. With deep net-cage farms, which the centre is now testing 17 off St John's Island, more than three times the amount of fish can be produced over the same surface area as shallow cages. 1 Response to "Blue Revolution"